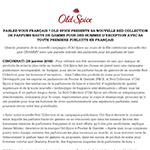 CINCINNATI--(BUSINESS WIRE)--Celebrating 80 years as the manliest grooming brand on the planet, Old Spice is taking scent to the next level with an over-the-top ad campaign, en français, to launch its new Red Collection premium scents for exceptional gents ... in the men’s grooming aisle. 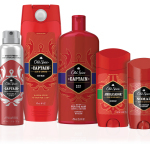 Developed by Procter & Gamble’s (P&G) fragrance experts, the Old Spice Red Collection is inspired by fine fragrance trends, enhanced with superior ingredients and the brand’s innovative, new “Fade-Resistant Scent Technology” that provides long-lasting scent benefits that resist fade. 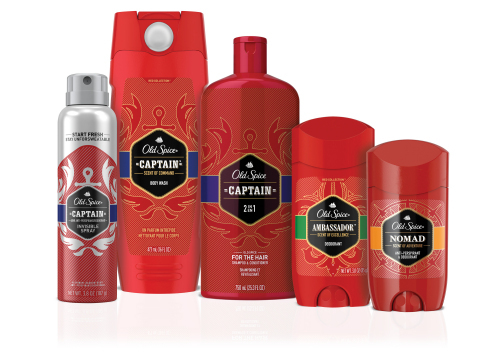 The Old Spice Red Collection comes in anti-perspirants, deodorants, body washes, body sprays and shampoos, proving that a premium, daily scent experience can be accessible to all guys, without breaking the bank. “Red Sweater” (:60) – A beautiful French woman sits by the fire, reminiscing about the man she once met who wore Old Spice … visualizing him aboard his ship after freshening up with Old Spice Captain body wash. Thankfully, she has his Red Sweater to remember him. Suddenly, something is amiss. She dashes out in a desperate search. "Old Spice! Old Spice!," she calls out. Soon "Old Spice" echoes throughout the village. The spot builds to a crescendo as dramatic music unfolds. At last, she turns the corner to be reunited with the fragrance she desires … her Captain. And that rascal dog, Old Spice. Captain: The Scent of Command. A modern scent with crisp top notes of water & citrus met with subtle green notes. Ambassador: The Scent of Excellence. A classic masculine scent with warm, caring notes of creamy amber freshened by spicy, woody top notes. Nomad: The Scent of Adventure. An innovative, aquatic fragrance that captures classic elements of fougere in an explosion of juicy citrus and crisp watery fruits. Exclusive to Old Spice men’s grooming products, the Red Collection also introduces the brand’s new “Fade-Resistant Scent Technology” designed to stop “noseblindness” that can happen with a product’s daily use, when the nose becomes habituated to smell and starts ignoring it. “Fade-Resistant Scent Technology” – Available in Red Collection anti-perspirants and deodorants, works by infusing P&G’s top-secret raw perfume ingredient mixture into the product. When combined, the result is perceived longer lasting, higher scent benefit over the life of a stick. When put to the test, 83 percent of guys agreed2 that the technology-infused deodorants worked as well after four weeks of use as on the first day. The Old Spice Red Collection is available nationwide at drugstores, grocery stores and mass merchandisers (MSRP: $4.99; Pricing at the sole discretion of retailers). This year, Old Spice celebrates its milestone 80th anniversary as the manliest grooming brand on the planet. The brand is kicking off its year of SMELL-ebrations with the launch of new Red Collection, with additional surprises planned for fans throughout 2018. For more information on the Red Collection and full Old Spice grooming line-up, visit OldSpice.com. For more on legendary manliness, visit Twitter (@OldSpice), Facebook (Facebook.com/OldSpice), YouTube (YouTube.com/OldSpice), Instagram (oldspice) and Tumblr (oldspice). Join the legendary conversation by following #OuiOldSpice. 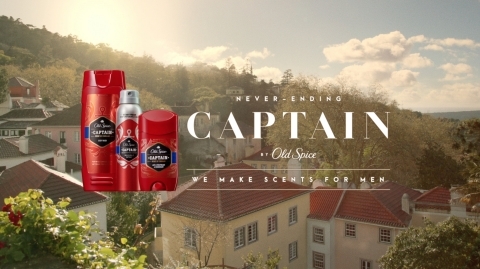 Procter & Gamble’s Old Spice is the quintessential men’s grooming brand. With 80 years as an American icon, Old Spice is the authority on the male grooming experience and has leveraged this heritage to become the No.1 selling anti-perspirant/deodorant stick and body wash brand with guys of all ages. 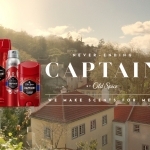 Old Spice offers a complete product portfolio for today’s man, including anti-perspirants, deodorants, body washes, body sprays, shampoos, hair stylers, electric razors and trimmers, shave gels, after shaves, colognes. Check Old Spice out at www.oldspice.com, Facebook (http://www.facebook.com/OldSpice), Twitter (@OldSpice), Instagram (oldspice) and Tumblr (oldspice.tumblr). 1 Study commissioned by P&G in 2016 with External Agency. 2 Study commissioned by P&G in 2015 with External Agency. PARLEZ-VOUS FRANÇAIS? OLD SPICE PRESENTE SA NOUVELLE RED COLLECTION DE PARFUMS HAUTS DE GAMME POUR DES HOMMES D'EXCEPTION AVEC SA TOUTE PREMIERE PUBLICITE EN FRANÇAIS.